Pears – the “gift of the gods”. Lovely yet unassuming, pears have held prominence in cultures for thousands of years. The tree is a symbol of longevity and immortality for many due to its ability to produce fruit for up to 100 years. The fruit is considered sacred and revered in both Roman and Greek mythology. Power-packed with nutrients, pears have long been considered ideal as baby’s first fruit. In the beautiful Pacific Northwest, it’s prime pear season and the farmers markets are bursting with numerous varieties. The states of Washington and Oregon are top pear producers for the country, with California also contributing. The combination of rich volcanic soil, temperate climates and the right amount of moisture creates perfect growing conditions, producing juicy, sweet fruit. 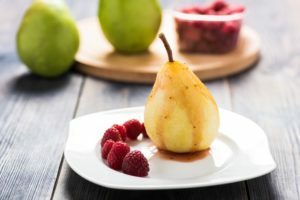 And, for only 100 calories, one medium pear provides a super food level of nutrition – 24% of daily fiber, 10% of daily vitamin C, and 6% of daily potassium. In addition to high nutrient value, pears fall low on the glycemic index claiming “smart carb” status. Did you know that pears are not actually ripened on the trees? Pears ripen from the inside out, so if tree-ripened as other fruit, they become brown and mushy inside. This means that fruit available at the market may not be ready for immediate use, and may require planning ahead. Ripening generally takes anywhere from 1 – 7 days. When selecting pears, use the “press test” to determine ripeness. Gently press a finger into the top of the pear where the fruit and stem join together. If there is a slight give in that area, the fruit is ripe. If it is hard, the pear will require a few days to ripen. Avoid pears that are soft anywhere but the stem area or those that have cuts or bruises. It is best to store pears at room temperature so they can ripen naturally. Avoid storing pears in plastic – they will become too soft and mushy. To speed the ripening process, place pears in a paper bag. Adding an apple or banana can help due to ethylene given off by these fruits. To slow the ripening process, store pears in the refrigerator until ready to finish ripening at room temperature. For further information on how to ripen and handle pears, check out USA Pears. Pears go well in both sweet and savory dishes, adding mild sweetness, fruit flavor and moisture. Sauces, compotes, jams and jellies love the addition of pears for their natural thickening properties. With many varieties available, choosing the right flavor and texture to enjoy raw or use in a specific dish is fairly easy. 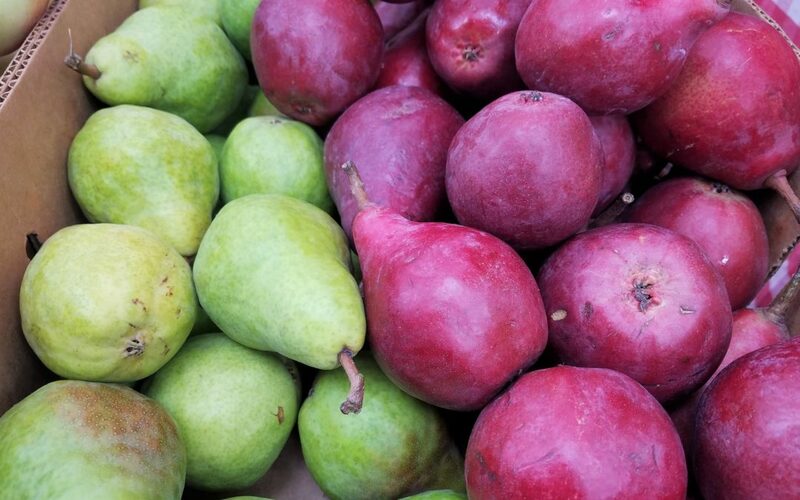 Check out our guide to Common Pear Varieties.